True, this is the starting point in determining what you are about to clean. However, as you develop your rug-cleaning skills, you should go beyond fiber identification and develop product knowledge, be it through training, attending seminars or reading rug-cleaning books. Because fiber identification is the best place to start in the rug cleaning process, let’s look at the main fiber you will encounter: wool. Just about any fiber can be made into an area rug, but the primary face fiber in rugs is wool, with cotton being the common foundation fiber. 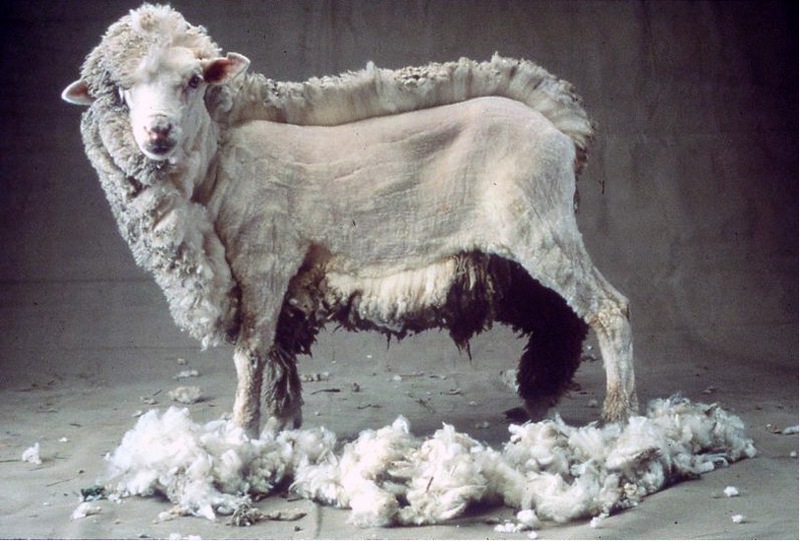 Wool is a protein fiber taken from the fleece of sheep. A simple burn test can be performed to determine if the rug you are about to clean has wool as the face yarn. Remove a tuft and burn it with a butane lighter. If it is wool, it will smell of burnt hair. The key cleaning concern with wool is dye bleeding. Always do a colorfastness test before cleaning. This is a simple test that should be done on all rugs prior to cleaning. Wet a white cloth towel with the ready-to-use cleaning solution. Give it a dwell time as long as possible, then check the towel for color transfer (left). To understand why wool can bleed, you should understand how it is dyed. Wool has an affinity for dyestuffs that react chemically and combine with the protein in its cell structure, bonding with either acid, neutral or alkaline dyes. However, the functional dye group for wool is almost always acidic. 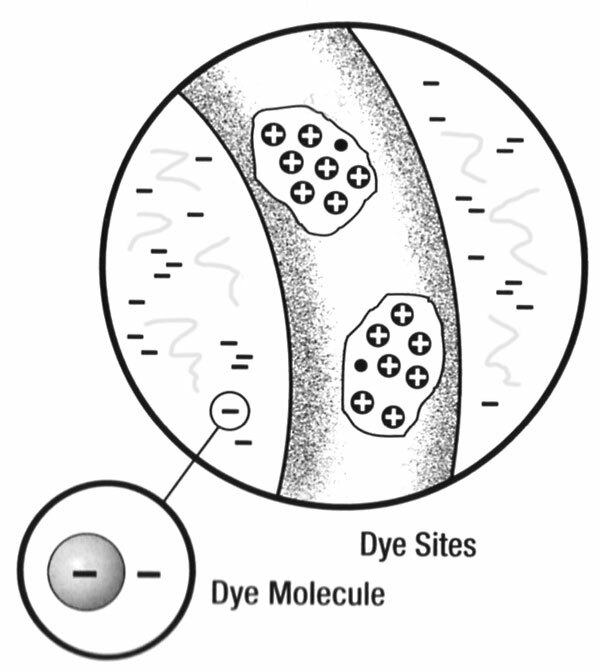 As dyeing take place, the acid group in the dye (which has a positive charge) reacts with a basic group on the wool fiber (which has a negative charge) and the dye and fiber become attached to one another (right). Because the dye is acid, the reaction is carried out under acid conditions; the finished wool rug will be acidic in pH, often in the range of pH 4 – 5. 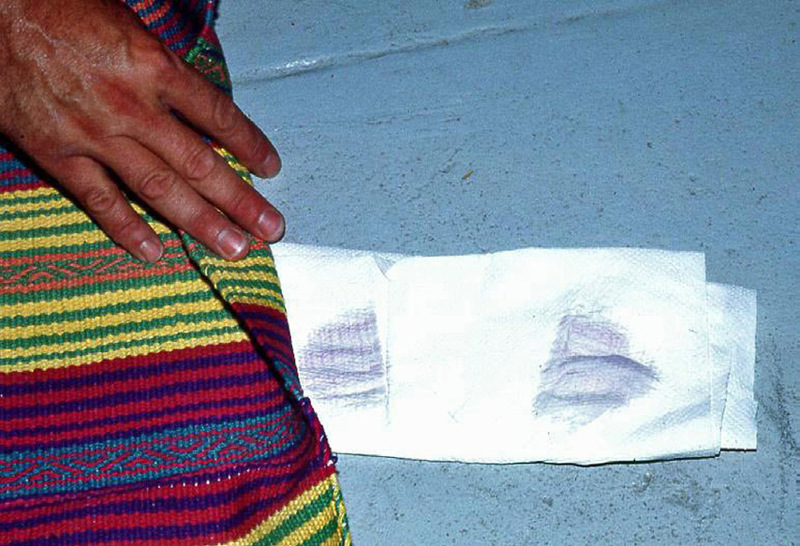 What causes bleeding to occur in wool rugs is the destabilization of the dye-fiber bond, caused by an alteration of the pH of the fibers. This change in the pH is not caused by an alkaline solution alone. Yes, we should use products that are not too alkaline, but we should also be aware of buffering agents. Buffers are additives that stabilize the pH of a detergent. Detergents are usually purchased in a concentrated form and diluted with water. Buffers give stability to the pH after dilution, allowing for higher dilution ratios. The pH of a product is only a general guideline. The stability of the pH, i.e. how well it is buffered, is the most important factor. Large amounts of a buffering agent (alkaline builders) in a cleaning product can cause a pH shift in a wool rug. Immediately or over time, this pH shift will result in dye bleed. Just noting a cleaning product’s pH will not indicate if it has been highly buffered. In order to determine the stability of a product’s pH, a test called titration can be carried out on the chemical. But it is impractical for a cleaner to perform such a test on all cleaning products. An organization called WoolSafe tests products for manufacturers and, if they pass, they are allowed to use the WoolSafe logo. To help protect rugs against bleeding, always use cleaning products that have the WoolSafe mark, and do a colorfastness test. In addition to using safe cleaning products, fewer dye bleed problems will occur if you use room-temperature water. Using cool water will slow down the cleaning process, but you can make up for this with increased agitation, dwell time or cleaning product. Another tip: if you are using a truckmount or high-pressure portable to rinse the rug, turn down the pressure. High pressure can cause pile distortion, so a setting right around 250 psi is enough for natural fibers (Image 5). Follow the basics: use the right cleaning chemistry; always do a colorfastness test; cool water; and watch the pressure, and you should avoid suddenly owning a rug that does not match your home decor.